I’ve lived in Portland for seventeen years, and of all the events, activities and festivals I’ve attended in the city, one of my absolute favorite is Sunday Parkways. The event is extraordinarily simple: several miles of urban roads are closed to cars and become the playground for bikes, pedestrians, strollers, roller bladers, unicyclists, anything BUT motorized vehicles. This year the Portland Office of Transportation in conjunction with ORBike and Metro have set three Sunday Parkways in three different neighborhoods of Portland. I missed the first one on June 21st in North Portland (and am now kicking myself for missing it), but did manage to attend the one on July 19th in North East Portland and it was exceptional. In addition to over 7 miles of closed streets the Sunday Parkways also features mini park fests along the way with food, entertainment, activities and free bike servicing. 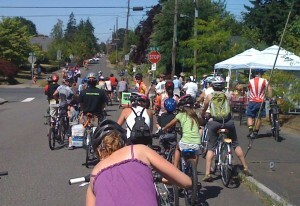 The third and final Sunday Parkways of the year takes place in Southeast Portland on Sunday August 16th from 9am to 4pm. Unlike other cycling events in Portland (like Providence Bridge Pedal) the Sunday Parkways event is completely free. There is not start or finish spot for the event. You can join in at any intersection and loop in either direction. A detailed map of the Southeast Sunday Parkways can be found here. There’s also a complete breakdown of all the vendors and events at each Sunday Parkways park (the main park stops are: Laurelhurst Park, Mt. Tabor Park, Colonel Summers Park and Sunny Side Park). The Southeast Sunday Parkway also intersects the Hawthorne Street Fair creating one of the most unbeatable combinations of events I’ve seen in Portland. Not only is this event free, it features a ton of goods and services which are offered free, including: Bike Empowered complimentary bike safety checks and repairs, BTA/Safe Route To Schools kids bike fitting and training (both at Colonel Summers Park), REI free climbing Wall and Portland Wheelman flat tire repair classes (at Laurelhurst Park). I’m hard pressed to come up with a better example of an event that illustrates why Portland is such an amazing city, it’s absolutely not to be missed. So do yourself a favor and make your way on Sunday to this amazing event. I'm writing to you to express my deep frustration over the fact that The Oregonian has omitted the Sunday Parkways event from the paper. The Oregonian seems to be going out of its way to omit coverage of this amazing event. Not only was it not listed under free or family events in the A&E, it wasn't previewed or mentioned anywhere in this week's Metro section or anywhere else in the paper. Sunday Parkways is one of Portland's greatest free events with over 9 miles of roads closed to cyclists, pedestrians, roller bladers and other non-motorized vehicles. Not only is this event an exceptional display of Portland's spirit, sustainability and bike culture it's a massive event that impacts the residents of the neighborhood. It's irresponsible for you as the regions major news source not to inform the people in the effected neighborhoods that roads will be closed and that the event is going to be taking place. At the last Sunday Parkways in Northeast Portland I spoke to several residents who weren't even aware the event was taking place in their neighborhood. I believe it's a clear failing of the Oregonian to consistently omit coverage of this event. Furthermore this omission smacks of politics. This very appearance of impropriatary impacts the very journalistic ethics which at this point is the very thing that insures the very existence of the Oregonian.